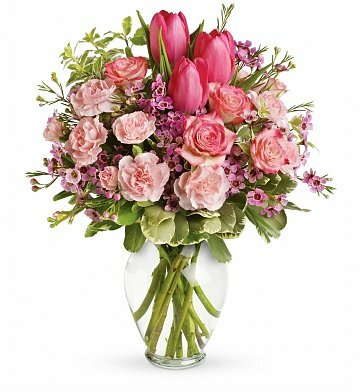 Welcome the romance of the season with this stunning collection of pink-hued blooms and lush greenery in a gracefully curving glass vase. Standard Arrangement Measures 12" x 14". Spring Love is a hand delivered gift. These gifts are delivered by one of our local design centers located throughout the United States and Canada. Same day delivery is available for most gifts when ordered before the cutoff time. The cutoff time for Spring Love is 2 PM in the recipient's time zone. I had this sent to my sister and she liked it very much! I was very impressed that the florist called to ask for approval to use dark pink roses in place of pale pink roses. That assured me they were very picky and intent on pleasing the customer! The arrangement was not quite as full as shown in the picture, however it was a lovely arrangement. Ordered these for my mother and she LOVED them. I have never ordered through this site before, and during the afternoon of the day of delivery I called to check on the status. I received excellent, friendly service. I also ordered a different arrangement for my mother-in-law (same day), and received the same wonderful service for that delivery. Refreshing! The gift for my friend arrived in time. Thanks. Good service and communication.